ViewSonic is famous for its LCD display, projector but have you ever wonder that it may emerge as one of the smartphone manufacturers in one day? 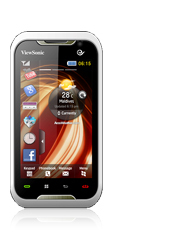 Targeted for China market primarily, ViewSonic is getting ready to release its V901, a Windows Mobile 6.5 based touchscreen smartphone by this quarter before end of year. V901 will be powered by PXA310 processor and with a standard 3.6-inch 480X800 WVGA resolution touch sensitive display, it will be designed with TouchWiz UI that intends to simplify its operation menu especially for those that are newly exposed to Windows Mobile devices. Since it is targeted for China mainland with huge population, it supports China Telecom CDMA 800MHz as well as EDVO Revision A and as expected, it integrates GPS (Global Positioning System), Bluetooth and 802.11b/g wireless LAN technologies. Internally, it is backup with 128MB RAM and 256MB ROM storage space and users can easily expand the storage capacity up to 32GB with its micro SD card slot. That is not all, its 5-megapixel camera module will able to differentiate it from the rest as even the Apple famous and latest 3G S only comes with 3.2-megapixel camera module. Measured at around 117.5 X 61.5 X 12.75mm and weighted at only 140gram, no doubt this is a great achievement for ViewSonic with its sleek and stylish flagship product especially when trying to enter the competitive segment in China market.